The great thing about the stock market, is that each day there are new opportunities. And this continues to be true, as we head into the second trading week of October 2016, these are the stock trading picks that are on my radar. And as shown in the SPY chart above, even though the market-at-large is more or less treading water, there remain opportunities brewing below the surface. Well, let’s dive into it, shall we? First of all, most of our initial October stock picks still look pretty good. 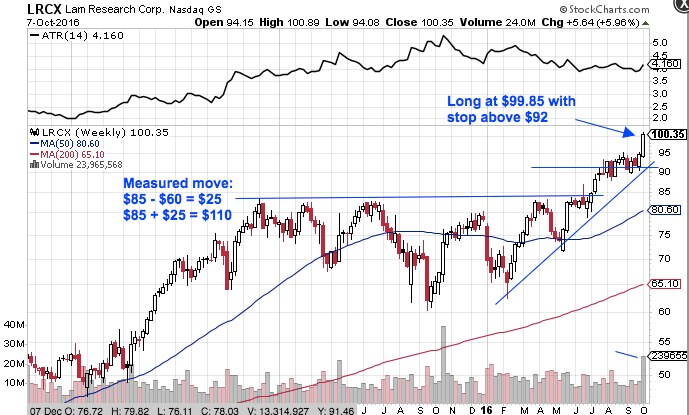 AMZN has been boogying while QCOM and ISRG consolidate their gains in a healthy manner. 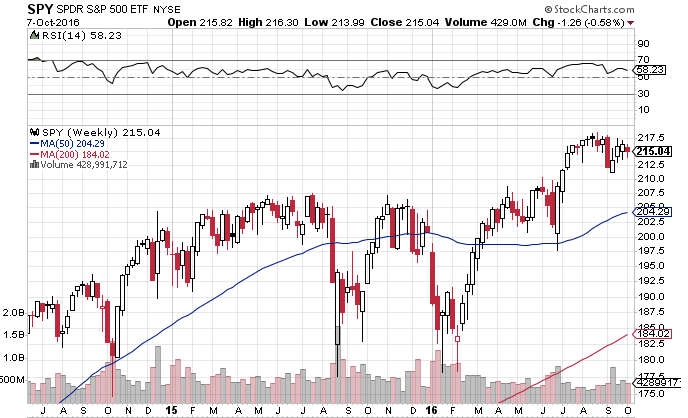 And notice, not only is the Nasdaq index near new highs, but the above tech stocks are also pushing to fresh breakouts. So it should be no surprise that some more tech stocks feature prominently in this weeks’ picks. 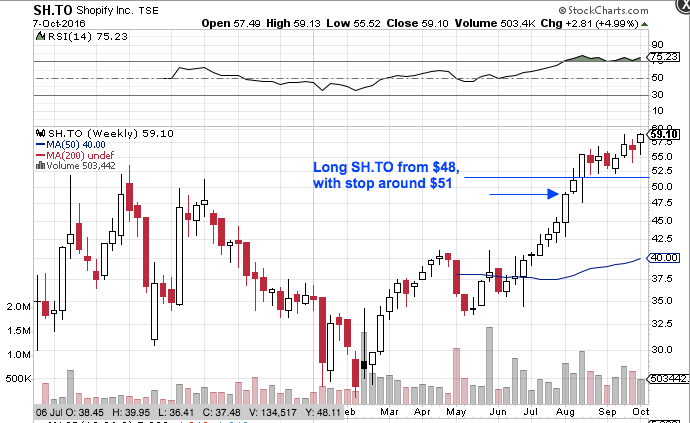 The first tech company on my radar this week is Shopify (NYSE:SHOP, TSE:SH). This commerce enabler has been performing strongly recently. The company hasn’t been public for too long but after an initial post-IPO dip shares have recovered and are pushing higher. The price chart reminds me of Facebook after it went public. Personally, I’m long the Canadian-listed version. But the US chart looks equivalent and I would be managing the trade the same way. In addition to the strong price performance, notice the buy volume. Buyers have been consistently legging in, which should provide more fuel for the fire. I think this company has a lot of opportunity to conquer. 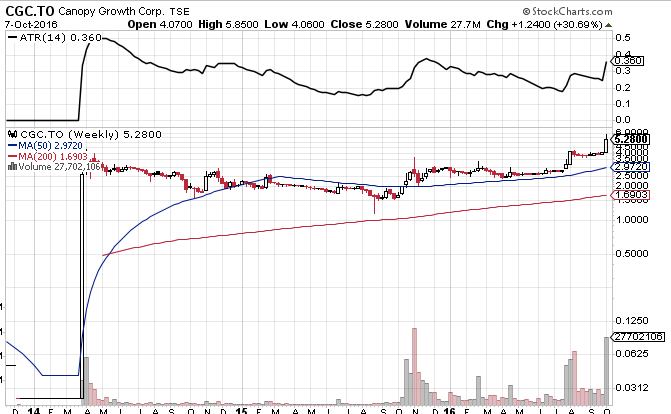 Another stock on my radar with nice volume performance is Canopy Growth Corporation (TSE:CGC). While most of the marijuana stocks have been blowing up the last few weeks, I think CGC is one of the best. The stock has been stair-stepping high. And given the changing regulations in Canada as well as the strength of this trend, I am happy to give CGC the benefit of the doubt. Personally, I’ve been long CGC for a while. But given last week’s strong price performance and impressive buy volume, I am considering adding on any follow-through next week. Given the explosive moves thus far, I’d even be willing to hold this stock for a few weeks of consolidation because it’s proven it can move over 15% in a single day. These weed stocks are not for the faint of heart. But I’m currently long CGC from well below current prices with a stop just above $4.50. Finally, Medifast Inc (NYSE:MED) is another stock that keeps moving in the right direction. While this chart isn’t quite as clean, MED has done well for me. And I wouldn’t rule out adding to the position. So there you have it. 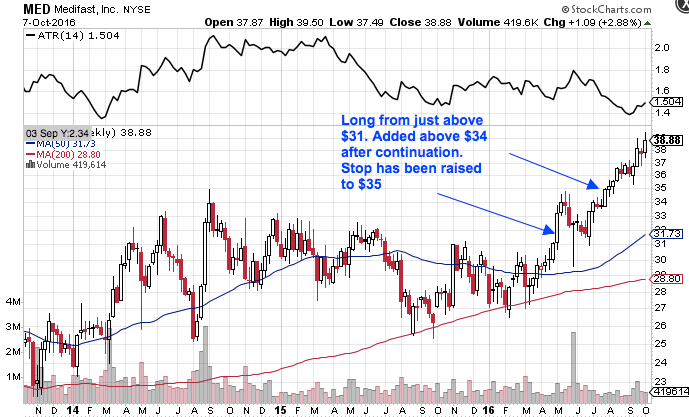 I hope this second edition of my October 2016 stock trading picks is of value for you. And feel free to shoot me a note or leave a comment if you have stock picks of your own that you want to share. Have a great weekend and happy thanksgiving to all the Canadians!